What happened!?! Our hero is hanging upside down! 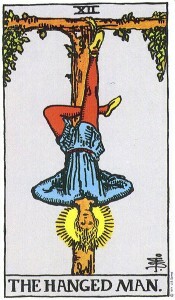 In the thirteenth edition of the Archetypal Tarot Podcast Julienne Givot and Cyndera Quackenbush help to dispel the superstition that often surrounds cards such as The Hanged Man, card number twelve in the Major Arcana. After an exploration of the Hanged Man’s symbolic imagery and the martyr archetype, this podcast illuminates an invitation to test the inner strength gained in the previous card and make valuable sacrifices during this period of “hang time” (yes, a sports reference made its way into the podcast). Also join the discussion of movies featuring the martyr archetype – you may just find a new perspective, or your world turned upside down! Cyndera also references this animation of a talk by Alan Watts done by the creators of South Park. Julienne’s article goes deeper into the myth and motivation of the Martyr Archetype. 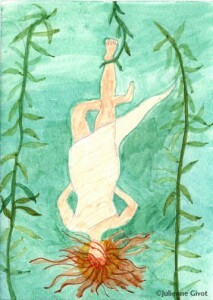 For the Hanged Man – pay attention to the course that Paul Giamatti’s character takes in The Lady In The Water (2006) as he is pulled out of his self-induced isolation to become a Hero and what he needs to sacrifice to do so.